Hospitality is something that we hear a lot about in the Christian community. We are supposed to be "hospitable"; break bread together, open our doors to help feed those in need, etc. So, what does that mean? What if hospitality just isn't my gifting? What I love about the Good Samaritan and looking at him for hospitality reasons is this: the story never once talks about him opening his own home. When I think of hospitality, I naturally imagine opening my home, serving dinner, offering a cozy place to sit and chat, or to sleep over. I think of those things because that is my gifting - that is what I love to do. Not everyone loves that, or is gifted in that same way and the Good Samaritan is a good example of other ways that we can be hospitable to one another! So how did the Good Samaritan show hospitality other than opening his home? He expressed compassion for another person regardless of who it was. He saw a need and he took the time to treat it. He offered his own transportation (offered a ride) to deliver the man where he needed to go. He offered his own money to house the man. We already know that some of the pieces of hospitality are opening your home, feeding someone, bringing food, offering groceries, etc - now we see that hospitality can be offering monetary support, offering time, expressing compassion in a tangible way, offering transportation, etc. Chances are, one of those things listed will speak to your gifting or a way that your family has been blessed that you can share with another. 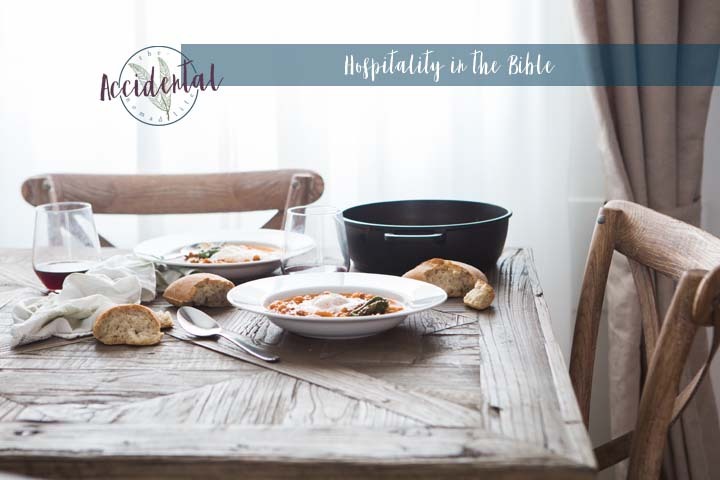 Hospitality is a very clear theme through the New Testament, especially through Paul's journeys - we'll take a look at those another time. I believe though, as a church body and family in Christ that we are all called to be hospitable. I hope that if that has scared you in the past, you've found a good way to use what God has given you to be hospitable, as the Good Samaritan was to his neighbor.